Torrevieja is one of Spain’s more unique cities. 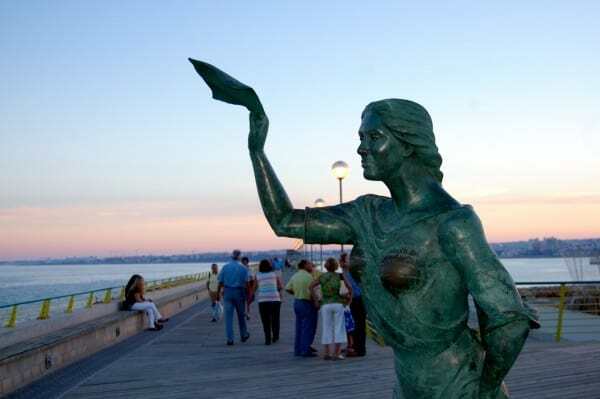 With a rich history of salt mining and ship building, the sleepy fishing village suddenly grew tenfold in the construction boom years and is now the fifth largest city in Valencia, and the largest new city, after Valencia, Alicante, Castellón and Elche. It’s easy to get to too. With two International Airports at San Javier, Murcia and Alicante-Elche less than a 45 minute drive away, the AVE high speed train covering Madrid to Alicante in just over two hours and with the Capital being just about a four hour drive away, it’s little wonder that almost 25,000 Madrileños have second homes. More than 80,000 people from the British Isles either call the city their home, or holiday home, just part of the rich mix of more than 120 different cultures that make up this little city of United Nations. First stop for most visitors is with Mike and Heidi at Coys Cars. They are celebrating both 25 years together and 20 years in business this year, a huge accomplishment on both fronts. 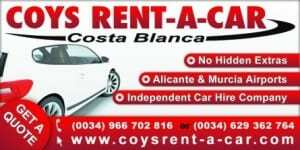 Coys have a great selection of cars to hire, plus a few on sale too and in this part of the world, a hire car is almost a must if you want to travel around the region. Plus, when you visit their web site, you’ll also find some special offers for their 20th anniversary. Confidence in the region is picking up, especially with the great exchange rate at the moment, with many Brits returning to region to purchase property, although this time round, less expensive properties in the sub hundred thousand euro mark seem more to fit the bill and Eva at Marsol is always on hand to help you look for something special, especially if it’s close to the beach or the town centre. On the other hand, if you are looking for something very special, from half a million euros and up, contact Darren at Titanium Properties, who would be delighted to help. When it comes to things to do, Torrevieja has number of great beaches, from La Mata, to Playa de Los Locos, Playa del Cura and to the south Playa Naufragos and Playa del Acequión. While it may be a little cool to swim in February, there are dozens of great waterfront cafes from which to enjoy your relaxing ‘cup of café con leche’, while you watch the world go by. 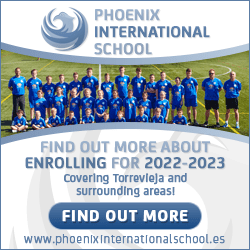 Since Torrevieja is based on residential tourism, offering more relaxation, leisure, lower prices, better infrastructure and free street parking, it may or may not come as a surprise that Torrevieja has more restaurants and cafes than Benidorm, although the city of fly-by tourism beats the entire Alicante prince hands down, when it comes to the number of hotel choices. Those visiting this St. Valentine’s weekend enjoyed a full night of Carnival fun on the main streets, which attracted upwards of ten thousand people, while there are many major shows and performances playing in and around the city, plus local pub nightlife to enjoy. 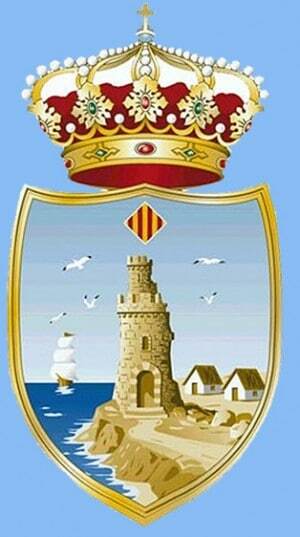 Torrevieja also offers possibly the best European Winter Climate, as per the WHO, World Health Organisation. Apart from being based on a Mediterranean hot spot, having two of Europe’s largest Salt Lakes and the closest mountains more than 30 kilometres away, affords the city with its own special micro-climate, allowing Torrevieja to often be three and four degrees warmer in the winter than anywhere to the north of Guardamar del Segura, west of Quesada or south of the Orihuela Costa, after which, temperatures can change. Tomorrow it’s time to jump in our rental from Coys Cars and find out something about the local film scene and The Cucaracha Club, the Torrevieja theatre scene, English language media, radio, TV,newspapers and magazines, plus going shopping and a few hidden secrets behind the City of Salt; just for starters …..